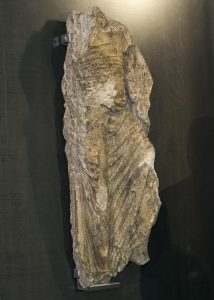 On 10 November 2016, while opening up a wall in the chamber located in the lower part of the cathedral bell tower in order to remove the image by Master Mateo buried in the same area and discovered a few days earlier, when the perpend stones that made up the wall were removed, a fragment of a male figure was found. It had been built into the wall, with the back being reused as construction material. Based on its characteristics, the piece has been ascribed to the so-called Master of the Wet Drapery, an enigmatic artist whose workshop was active in the cathedral around 1070. The cathedral museum contains three other pieces attributed to the same artist or workshop. 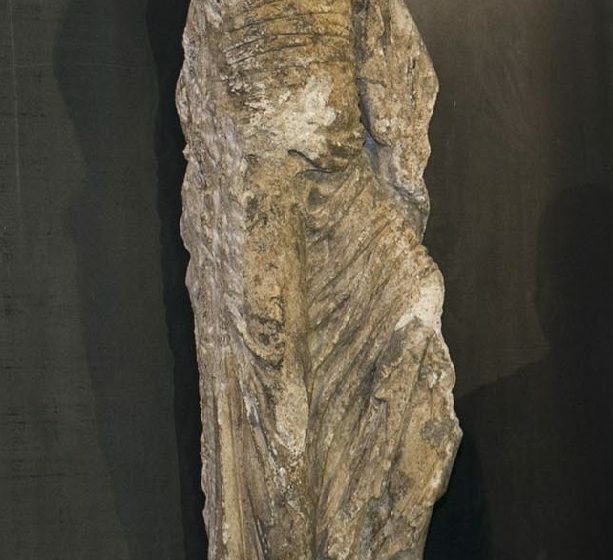 All of them are linked by one common feature, the folds and treatment of the clothing, clearly influenced by classical models. The most immediate parallel is contemporary Burgundian work. Following the discovery, the piece was thoroughly cleaned to remove the mortar attached to it. This work was carried out by the restoration department of the Cathedral Foundation. This prepared the piece, which still requires a more comprehensive restoration, to form part of The Power of the Past: 150 years of archaeology in Spain, an exhibition opening this October. After its presentation, the piece will be on public view in the Grammarians’ Hall at Pazo de Xelmírez until 11 September, when it will travel to Madrid for the aforementioned exhibition. When the show closes, it will be placed on permanent display at the Santiago Cathedral Museum, which will celebrate its 90th anniversary in 2018. Previous Post:VIVE O CAMIÑO. Theatre, humour and music on the Way of St. James.